Flamingos personalised anniversary or Valentines card by Jenny Arnott Cards... perfect for a special couple, or your husband, wife, boyfriend or girlfriend on your anniversary. 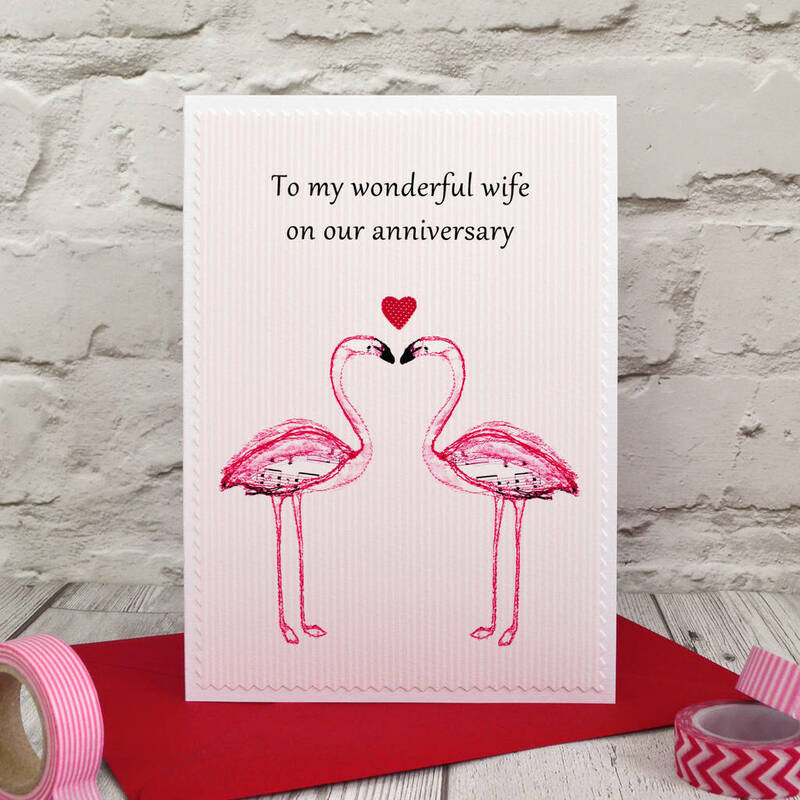 These lovely flamingo anniversary cards / Valentines cards are suitable for both men and women and come in a large A5 size with a red envelope. It has two pink flamingos facing each other with a pink stripe background and a red heart between them. Let your partner know how much you love him or her on your anniversary, whether it is your first anniversary together as a couple or you are long term partners celebrating your wedding anniversary. These lovely handmade cards can be personalised for any and all anniversaries, 1st first paper, 2nd second cotton, 3rd third, 4th fourth, 5th fifth, 6th sixth, 7th seventh, 8th eigth, 9th ninth, 10th tenth, 11th, 12th, 13th, 14th, 15th, 16th, 17th, 18th, 19th, 20th china, 21st, 22nd, 23rd, 24th, 25th silver, 26th, 27th, 28th, 29th, 30th pearl, 31st, 32nd, 33rd, 34th, 35th coral, 36th, 37th, 38th, 39th, 40th ruby, 41st, 42nd, 43rd, 44th and beyond. 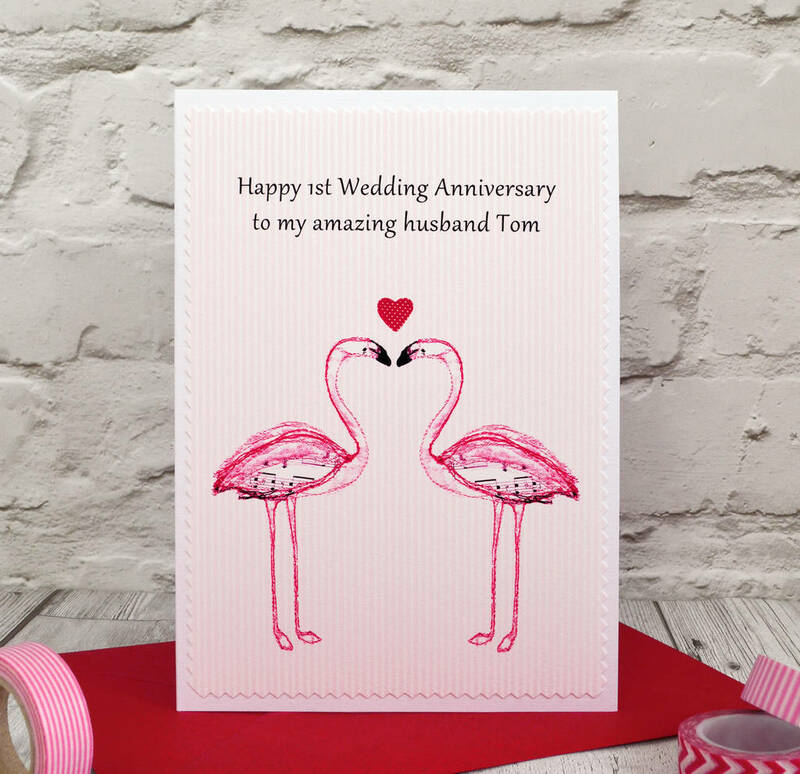 I make a wide range of other personalised anniversary cards, valentines cards and engagement cards - just click on the 'see seller's complete range' link below to see the whole collection. The card itself has a textured linen finish and is blank inside for your own message. It comes with a red envelope and is sent by first class post, protected in a clear cello wrapper and board backed envelope.